The traditional use of an annuity is to safely turn accumulated assets into income. The concept of converting a lump sum of cash into an ongoing income stream has been around for thousands of years, and it actually dates as far back as the Roman empire. But while the simple premise of annuities is to produce income, many of today’s annuity products offer a long list of other “bells and whistles” which can make them a tad bit complicated. And in fact, in some cases, these bells and whistles actually dilute the overall value to investors. So, should annuities even have a place in your portfolio? The most accurate answer is, “It depends”. The annuity that’s right for you depends on what exactly you want the product to do for you. To use an analogy, if you’re looking for a car, you could choose anything from a Ford Focus to a Ferrari. Both vehicles get you where you need to go, and if all you need is to get from point A to point B, save your money and get the Ford Focus. But if style, speed, and prestige are important to you – and money is no object- then the Ferrari is the way to go. As with cars, choosing if an annuity is right for you, and then selecting which specific annuity product to use, is dependent on a long list of personal factors and priorities. So, before completely ruling an annuity out or in, the first step is to really think about both your current and future financial needs, and then move forward from there. We’ll explore the specific types of annuities in each of these three areas to get you pointed in the right direction. There are several ways to create ‘Income Now‘ from annuities. An immediate annuity will start to pay out an income soon after you purchase it. (In most cases, the first income payment comes within 1 to 12 months based on what you choose.) Immediate annuities are often funded with money from an IRA, 401(k), or other retirement account, and it is quite simply a vehicle for converting a lump sum of money into an ongoing income stream. There are Immediate Annuities that come directly from insurance companies, often referred to as a ‘SPIA’, and there are Immediate Income Secondary Market Annuities that are only available through DCFAnnuities.com. Both produce ‘Income Now”, but the primary difference is that a SPIA is typically a lifetime income stream that may or may not have a period certain portion, whereas a Secondary Market Annuity is a guaranteed period certain payment stream that pays to you or you heirs and is not tied to a lifespan. In some ways, fixed indexed annuities can provide a “best of both worlds” scenario. That’s because the return on this type of annuity is based in large part on the performance of an underlying market index, such as the S&P 500. However, if the index has negative performance, there are no negative returns in your annuity and your principal stays safe. There are some trade-offs here, though. Fixed indexed annuities can be a good option for those who still want some market-linked growth, while at the same time keeping money safe from market volatility. There are Deferred Income Secondary Market Annuities and there are Deferred Income Annuities sometimes given the acronym “DIA”. DIA are typically lifetime income streams that start far in the future, like at your age 80 or 85, and are optimized for longevity protection. The work really well for younger healthy people who want a ‘pure play’ actuarial bet on living a long time and ensuring you can never outlive your money. Some deferred annuities can be funded over a period of time, others are funded in a single lump sum purchase price. But either way, because these annuities don’t start paying out income until a date in the future, the money inside the account has the opportunity to grow and compound. This growth takes place on a tax-deferred basis, meaning that there is no tax due on the gain each year. Deferred Income Secondary Market Annuities are period certain guaranteed payments sold by individuals at a discount. Only available through DCFAnnuities.com, these payment streams pay to you or to your heirs and offer a higher yield and definite source of guaranteed deferred retirement income. Because of the tax-deferred growth of all types of annuities, some call annuities a ‘Triple Compounding’ instrument as the money is able to generate a return on the principal, as well as a return on the interest, and a return on the money that would have otherwise been paid out in taxes each year. Fixed Annuities appear in this list as an option for ‘Income Later’ because once again, various characteristics of some index annuities are optimized for producing ‘Income Later’ from deferred, compounding accumulation that is tied to a future income payout rate. The devil is in the details of which index annuity you chose, which is why it’s essential that you Contact Us to let us help you pick the right one. With so many options, riders, and configurations, the right index annuity for you can be ‘just right’, but the same contract can be totally wrong for someone else. Lump Sum Secondary Market Annuities are one of the best ways to protect and grow money in a tax deferred, compound manner. These are typically single payment, absolute guaranteed and period certain payments from top rated carriers. Click on to learn more about Lump Sum Secondary Market Annuities. Fixed Annuities will pay a certain interest rate over a set period of time while the funds are in the “accumulation” phase. Similar to CDs, the return on fixed annuities is typically somewhat low. However, these products also offer guarantees and principal protection, so they can be a viable option for those who are seeking safety. And as with deferred annuities, fixed annuities grow on a tax deferred basis and enjoy triple compounding. Here they are again! A fixed indexed annuity can provide a “best of both worlds” safe growth scenario. The right contract that is optimized for growth and is not burdened by add-on immediate or deferred income riders can be an excellent safe-growth option. It’s generally not advisable to make a blanket condemnation of an entire product class because there are always exceptions to the rule. But as a very well known money manager has made himself into a billionaire doing just that. This advisor is raking in money under management (at egregious annual fees and with dubious performance), all by bashing annuities. 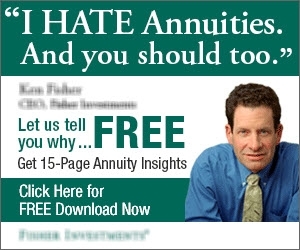 While I don’t like the poisonous advertising tactics that tar the whole industry with a broad brush, I do happen to agree with him in a limited capacity when it comes to variable annuities. Here’s why. Variable annuities offer an insurance company wrapper around market based investments. The problem is, both the insurance wrapper and the market-based investments carry ongoing fees, and the investment itself is typically burdened with front-end sales charges and ongoing surrender fees. All together, variable annuities offer the hope of a return tied to the performance of underlying investments, but the reality is that real world returns after all the fees rarely add up. Unlike a fixed annuity, there are no return guarantees with variable annuities, so almost no matter your risk tolerance, time horizon, and future income needs, a variable annuity is rarely a good option for you. I am willing to be corrected when presented with a growth oriented, low fee variable annuity, but I have not seen it yet. Period Certain – The period certain income option will guarantee a specific payment for a set period of time such as ten years, twenty years, etc. If the income recipient (also known as the annuitant) should pass away before that time period has elapsed, the remainder of the payments in the guarantee period will go to a named beneficiary. Life with Period Certain – The life with period certain income option will pay out an income stream for the annuitant’s life. However, if the annuitant dies before a certain period of time – such as ten years – the remaining payments will go to a beneficiary. (If, however, the annuitant lives longer than the period certain, the income payments will stop after the set time period has elapsed). Lifetime (also referred to as Life Only) – As its name implies, the lifetime income option will continue to make income payments for the remainder of your life – regardless of how long that may be. This annuity income option can help to alleviate the concern about running out of income in retirement. In addition, it can also reduce, or even eliminate, the need to reinvest or reallocate funds in the future, as you would have to do with bonds, CDs, or other income-producing vehicles. Many annuities will also offer a joint and survivor income option. This alternative is often chosen by married couples or partners, as it ensures that income will be paid out for the remainder of both persons’ lives. In some cases, the dollar amount of the income payment may be reduced after the first person’s death. For many years, bonds have been relied upon for retirement income. This is due in large part to their “safety,” as well as their steady income payments. Yet, while bonds are oftentimes the income generator of choice for retirees, the truth is that in a rising interest rate environment, even though you will still receive income, bonds can lose value – and when the time comes to sell, you could end up locking in a loss. Even a longer-term bond will eventually mature – and when the time comes to reposition this money, vast changes in the amount and/or the timing of your retirement income could take place. This isn’t the case with annuities, though – particularly fixed indexed annuities. In fact, in many ways, fixed indexed annuities can offer everything that bonds can – including safety and income – along with some added flexibility. Plus, while most annuities will impose some type of surrender or withdrawal penalty (at least for a certain period of time), these financial vehicles will typically allow you to withdraw up to 10% of the contract’s value each year penalty-free. That being said, a lot can ride on the specifics of the annuity, such as the way in which your return will be credited, the cap (if any) that is imposed, and the terms of the annuity’s withdrawal/surrender period. Having all of this information at your disposal before you make a commitment allows you to make a truly apples-to-apples comparison, and in turn, determine whether one – or even both – of these income-producing strategies are right for you. Enhanced death benefit – Some annuities offer the option of an enhanced death benefit. (This differs from the regular death benefit that is included with most annuities). The enhanced death benefit feature can allow for a minimum amount of death benefit value and/or a higher benefit amount that is paid out to the beneficiary. These funds are typically received free of any surrender or withdrawal fees. (Unlike a life insurance death benefit, though, annuity death benefits are generally taxable to the recipient). Nursing home / long-term care waiver – The need for long-term care has been growing over the past couple of decades. In some areas of the U.S., just one month in a skilled nursing facility can cost in excess of $10,000. Because regular health insurance does not cover long-term care needs, and Medicare pays very few – if any – of these costs, funds may have to be siphoned from personal savings in order to cover such needs. Today, many annuities have a provision that allows access to some, or even all, of your funds, penalty-free, in the event of a nursing home stay. Terminal illness waiver – Annuities today may also offer a terminal illness waiver. Here, too, if the annuitant is diagnosed with a qualifying terminal illness, funds can be accessed without being charged any surrender penalties. Disability waiver – It has been estimated that the risk of incurring a disability between the ages of 20 and 65 is much greater than that of dying. So, having access to funds for paying everyday living expenses can be beneficial. With an annuity disability waiver, money from the contract may be distributed, provided that you have a qualifying condition. Depending on the annuity, some or all of these added features may be included at no additional charge, or alternatively, they may require that you pay an additional amount of premium. Are Annuities a Good Fit for Your Future Income Strategy? Regardless of what features come with an annuity – or for that matter, any financial vehicle – whether or not the product will fit well with your specific goals and needs should always be the initial step. When it comes to annuities, converting a sum of money into an income stream is usually a permanent choice. Once you have done so, it can be expensive to turn the annuity back into a lump sum of cash. With that in mind, the choice to annuitize should not be taken lightly – especially if it’s flexibility that you’re after. On the other hand, if your goal is to ensure that you have a steady stream of income that you can rely on for a set period of time – or even for the remainder of your lifetime – then including annuities in your overall financial strategy only make sense. Because annuities – and in particular, fixed indexed annuities – can provide you with more safety, more flexibility, and higher yield potential than bonds, these financial tools can be an integral component of your retirement income strategy. But, because annuities are not all the same, even if this type of financial tool has a place in your portfolio, it is still important to ensure that you have the right annuity in place. And, while this can entail some number crunching and product comparisons, taking the time to narrow down your option(s) can be well worth it. With the DCF Strategy, we do all of the legwork for you so that you can focus on other things, like how you will spend your time in retirement. If you have questions on how annuity income may – or may not – fit in with your financial objectives, or even if you just have a question about how income from annuities can be set up, Contact DCFAnnuities to get started today. DCFAnnuities.com specializes in analyzing all types of income annuities so that you can get a clear picture of how these financial vehicles operate, and what you can anticipate if you opt to move forward with purchasing one. So, Contact Us for more details.